Last year I nailed our Christmas Cards. I really put a lot of effort into the photos and made sure that the photos and the card I chose went together. Sometimes having just the perfect photo doesn’t make the perfect card. Find the card that perfectly suits that photos is key to bringing the whole look you are going all together. This year I want to do something sweet and simple. I want to get a family photo taken with all of us in one picture. Last year I was sure I could handle it with no ones help and in the end we had to be in different photos since I couldn’t take a photo with me in it and I lack a tripod. I love the look of cards that display one prominent photo. Tiny Prints had so many beautiful cards to pick from (with as many photos as you’ll need!) and it took me forever but I managed to narrow it down to my two favorite! When you go through all the choices of Christmas Cards you’ll see you can pick from several different formats. While normally I like the folded card style over the flat, postcard-like cards both of my favorites are flats. Above the Jolly Sing-a-long is so cute! It’s actually available in three different color options but I like the tomato option as the card brings a fun Santa like look to it. I also love the Sweet Watercolor option. I love that it reads ‘MERRY Christmas’. While I’m not a really religious person I still think the meaning of Christmas is important and should be said. 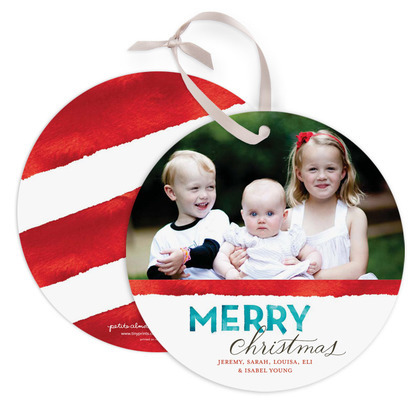 I also love that this card is round and can be placed on the tree like an ornament, not just for this year but for years to come. This card is also available in three color options but I love the candy cane effect this one has with the red and white. I highly recommend popping over to Tiny Prints and taking a look at their huge selection of Holiday and Christmas cards. No matter what you’re celebrating this season they are sure to have a card to fit your style and your family! Mom Spotted Review Policy: I will be provided with 50 Holiday cards at no cost by Tiny Prints in return for writing this post. This post was written by me in my own words and opinions. I can’t believe Christmas cards are being spoken of!